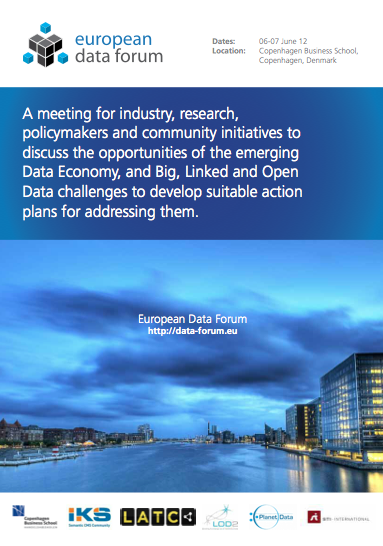 On 6 - 7 June 2012 - for the first time ever - the European Data Forum (EDF) takes place at Copenhagen Business School in Denmark. The first day of this brand new conference format around the issue of the rising data economy and several topics around and along the data value chain (as big data, open data, linked data et al) was a great success! With today 23.05. 2012 the full and final programme of the European Data Forum 2012 (EDF2012) - taking place in Copenhagen, Denmark 06 to 07 of June 2012 at the Copenhagen Business School - is finalised. The EDF2012 organising team is happy to announce Jimmy Kevin Pedersen of the Agency for Digitization - Ministry of Finance, Denmark - as an invited talk speaking about 'New trends in public service and Citizens Communication' in Denmark. The EDF2012 organising team is happy to announce Karl Nimfuehr of IBM as an invited talk speaking about Industry Big Data solutions. The EDF2012 organising team is happy to announce Karl Morteo of the Food and Agricultural Organisation of United Nations (FAO) as an invited talk speaking about the FAO Data Portal: data.fao.org. Imprint | Copyright © STI International 2014. All rights reserved.